At a time when many of our friends are becoming somewhat reluctant “empty-nesters,” my husband and I are in the process of realizing that we need to continue homeschooling our children even beyond their graduation. At 19, neither of our special-needs twins are able to attend college, yet both want to continue learning. Over time their difficulties have not lessened, but increased. Because of this we have learned to relax our expectations, but not the quality of our courses or methods. My son has embarked on Introduction to Logic, Introduction to Music Theory, Introduction to Composition, and other classes at home. He learns slowly, but with Socratic questioning and purpose. As his medical conditions progress, he hopes his continued education will strengthen his otherwise weakening mind. We required years to master Latina Christiana I, but Michael told me, “Latin is so meticulous and systematic, I think it takes my boggled mind and sorts it out.” He added, “I want to study Latin forever.” His twin sister Michelle chimed in, “Me too.” Most of my daughter’s academic abilities never progressed to the level of her brother’s, but she enjoyed beginning elements of each area in the liberal arts, all bathed in truths from theology, the queen of the liberal sciences. 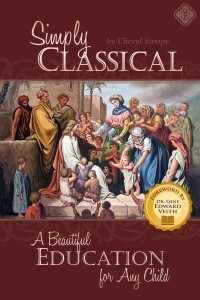 As classical teachers, we want to help our children love truth, goodness, and beauty. We encourage this through the liberal arts and sciences and the great literature of Western civilization. Each of our children have been able to grasp different aspects of this. One day we read The Merchant of Venice together. My concrete-thinking son understood very little, but Michelle loved Portia’s famous speech on mercy. She played Portia in each scene. When Bassanio (reluctantly played by Michael) noted that outward appearance does not always indicate inward beauty, Michael paused at the wisdom of this insight. In the play, Bassanio references Troy and Hercules, so we recalled our beginning classical studies. Hours later the same day, my husband located some star guides and gathered the children. Equipped with binoculars, we all settled in on a big blanket for an early autumn evening of stargazing. On such occasions, we see how all learning comes together in gratifying ways. Lying still in an open field near the woods that night, we marveled at the numerous clusters of stars in our country sky. My daughter recalled Abraham and the promise about his descendants. My husband identified the constellation Aquila. Michelle said she knew from Latin it would be an eagle. We smiled to ourselves. My husband pointed out various constellations and the planet Mars. The names of constellations prompted stories from Greek and Roman mythology, and our children know these far better than we do. As a family that evening, we all relaxed together, captivated by one of those rare moments that instantly beautify family life. When the darkness deepened in the sky, we spotted the Big Dipper low on the horizon. My husband noted the trapezoid shape of its ladle, and my children agreed. They knew the shape from early geometry studies. He pointed to another constellation, “forty-five degrees from the bright star overhead.” As the children followed his finger, I remembered all of the protractors from our many years of basic geometry lessons together. We searched the rugged craters of the moon through our binoculars. My son surprised me by noting the half moon’s appearance as “a perfect semi-circle, with the diameter bisecting the whole.” Then for a moment we fell silent. Originally published in The Classical Teacher Late Summer 2014 edition.